It's finally here. The long awaited Robot has been one of Bustin's top projects since before the release of the Ibach. We've been working day and night on these, testing and making small changes, to release a bi-directional drop-through deck as a top level freeride machine. The Robot began as a symmetrical Maestro shape, but it was clear after a couple months of riding that we needed something that could handle more versatile setups and really specialize in downhill, freestyle and freeride. The Robot shape is everything you need in a comfortable freeride board. All function, no fluff. We decided to release it in two different lengths — the 41-inch version more geared towards hills and freeriding and a 36-incher for city thrashing and freestyle. Either board will perform in any of these disciplines. The level of performance is up to you! The Robot was designed from the ground up to fill a gap in the Bustin lineup that had been asked for time and time again over the past couple years. The Ibach was our first "freeride capable" board, but the Robot is the first drop-through version. We went through over 6 months of testing with this board, asking our riders to push the board's and their own limits, making small changes each time until it was perfect. The industry continued to evolve during the design process, and we responded by including gas pedals, versatile cutouts for tons of setup combinations, and 36-grit, epoxy sealed and laser cut grip tape. The 41-inch Robot is designed for the freerider in all of us. With a 31-inch wheelbase, the deck is stable at speed and has enough effective footspace for most any rider to thrash on. The stiffness of 9-ply maple gives riders tons of leverage over the trucks for ultimate control and turnability, yet the drop-through design lowers the center of gravity, increasing stability and slide-ablity. The Robot 41 can be set up with any 50-degree truck and up to 75mm wheels or 42/44-degree trucks with 70mm wheels. The Robot 41 also makes use of the gas pedals, which relieve the deck of crazy foot cramping concave but increases grip by giving extra leverage to the foot during slides. This deck also has a notch taken out of the middle of the deck on either side. This both lightens the deck and provides for a safe and secure spot on the board to footbrake at high speeds. We are finding that most riders these days are modifying their grip in one way or another after they purchase their boards. Stock grip tape is fine for cruising around, but it isn't cutting it for aggressive riding and sliding. In response, we're offering a stock 36-grit, finger-cutting, epoxy sealed grip tape to the Robot. The epoxy seal both adds longevity to the grip tape and makes it extremely water resistant, so the weather takes less of a toll on your board. 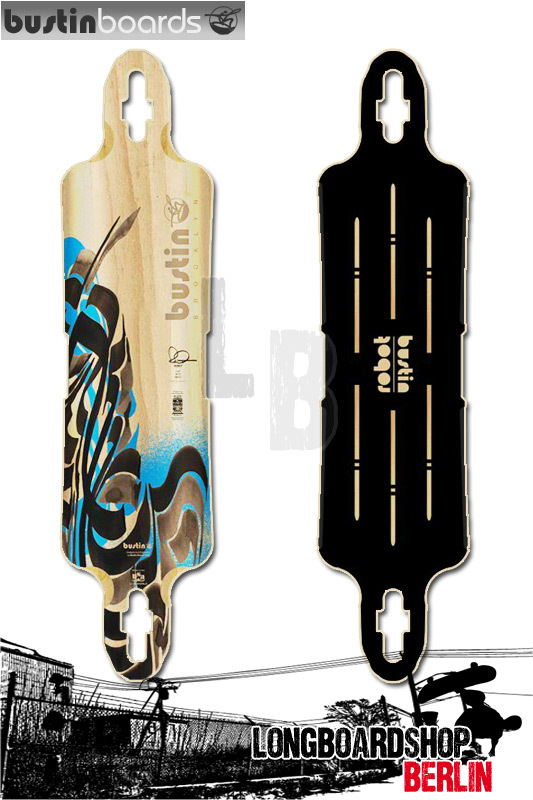 The grip is laser cut in the middle with a mirrored "Bustin Robot" graphic. It is then cut with three stripes on either side which create a multi-level surface on the deck with additional edges. This translates into more grip on your feet. It then wraps around the gas pedal, providing extra grip while sliding. We didn't put bindings on this deck, but you might feel like we did. The Robot is designed for almost any sensible setup. Most 75mm wheels will work with Caliber 44s, which means you can fit almost anything on this board. Paris trucks are excellent for hard carving and will work with any 75mm or under wheel, and stock Randals 50s or 42s will work with just about anything as well. Bear trucks will be super smooth turning and completely bite-less with any wheel 75mm and under and will even fit some of the larger wheels on the market.